There are three formats for the 2016 IEEE International Symposium on Antennas and Propagation and North American Radio Science Meeting: Interactive Forum (Posters), Oral, and Student Paper Competition (SPC) poster presentations. If you do not know the particular format for your paper, please consult the advance program. Guidelines for interactive forum, oral, and SPC poster presentations are given below. Every accepted paper must be linked to a registered person by May 1, 2016. Any paper not linked to a registered person by May 1, 2016 will be withdrawn from the technical program and proceedings. If you are unable to present your paper personally, please arrange for someone else to present it. If no one is available to present your work, you must notify the Technical Program Co-chairs as soon as possible (papers@2016apsursi.org) so that it can be withdrawn. As per IEEE directives, papers that are not presented will not be included in the conference proceedings on IEEE Xplore. The venue for the Interactive Forum sessions will be the Grand Caribbean Ballroom, located on Level 1 of the El Conquistador Resort. Rectangular boards will be provided, with the face divided in half. The usable area for a single presenter is 46 in. (117cm) tall and 46 in. (117cm) wide. 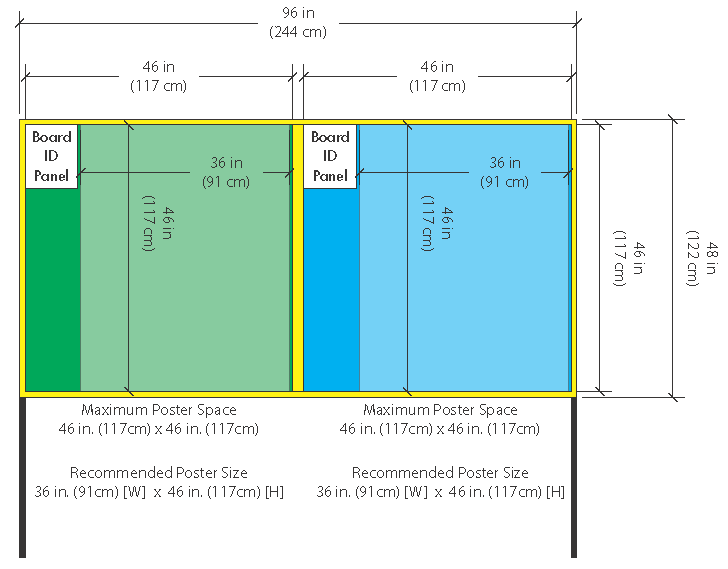 The poster is not required to fill this entire space; Posters MAY NOT EXCEED 46 in. (117cm) WIDTH OR 46 in. (117cm) HEIGHT. Push pins or other attachment methods will be provided. Note, however, that THERE WILL BE NO ACCESS TO ELECTRIC OUTLETS. Thus, your laptop should be fully charged if you want to use it as part of your presentation. You may download a template for the AP-S/URSI 2016 poster in PDF Format or in PowerPoint (.pptx) Format. Note that this is for the recommended poster size of 36 in. (91cm) wide by 46 in. (117cm) tall. Authors should set up their posters at least 45 minutesbefore the start of the session (09:20 start in the morning and 14:40 start in the afternoon) and must be present at their posters for the first 60 minutes of the session (09:20-10:20 for morning sessions and 14:40-15:40 for afternoon sessions). You may remove your poster 45 minutes after the session time is over. All papers must be presented in person at the symposium in order to be included in the published proceedings appearing in IEEE Xplore. APS/URSI 2016 has partnered with GoPrint to offer a discounted poster-printing service for our conference presenters. GoPrint will print a 46 inch high by 36 inch wide poster for US$84.00 and deliver it to the symposium registration area prior to the opening of registration on Sunday. The poster board size and recommended template are found earlier on this page. Download GoPrint's File Preparation Instructions. Contact Rafael Vazquez at rafael@goprintpr.com or at 787-200-8085. The last day to place a poster print order is June 17!